Visually stunning presentation of data. Choose your own graphical style. 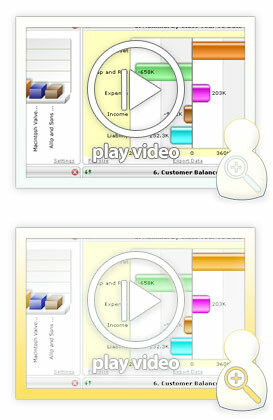 Real-time integration of Opera 3 data, producing up-to-the-minute financial and business information. Set up individual dashboards based on users role. Drill down to underlying data. Further drill down to document image. In today's competitive business environment organisations need access to their business data in a format that will assist in making the right decisions, manage performance and drive results. Executive Dashboards provides a visually stunning presentation of key business data in real time, through a wide range of user selected formats, with powerful drilldown to underlying data. This allows the management team to easily identify trends and issues and take immediate action. 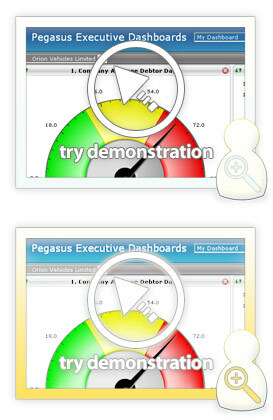 Each operator can define their own individual Dashboard, depending on their role and responsibility. Relevant critical information for each area can be tracked such as sales performance, financial key performance indicators and stock levels, enabling informed decisions to be made quickly and effectively. Therefore if you are a managing director, financial manager or head of sales, you can have your own Dashboard designed to fit the way you see the business. The Executive Dashboards use the standard Opera 3 security settings for access rights and can be distributed through a standard Internet browser. This means that remote users can access their critical data wherever they are and take any necessary action from the information received. The Executive Dashboards are linked to Opera 3 data in real time so that any information displayed is up-to-the-minute with the ability to drill down on business data and further drill down to the document image, such as an individual sales invoice. In addition to this, operators can filter the information within charts and graphs to create a personalised dashboard to suit their needs. If you require further data manipulation, information from individual dashboards can also be exported to MS Excel without the need to cut and paste. An innovative feature of the Executive Dashboards is the ability to set alerts and identify exceptions within your business. This enables you to identify and track business performance and operational activities that are critical to the success of the business on an ongoing basis.